With Easter coming up in just a few days, I just wanted to know if you planned on posting some songs that were Easter related? Three songs that come to my mind immediately are THE BUNNY HOP by Ray Anthony and or the Appeljacks, I WANNA BE AN EASTER BUNNY by the Singing Reindeer (1960) or THE CHICK by Lee and Paul out of 1959, a record incidentally that peaked at number 8 in March of 1959 here in OKC. It’s been a while since I’ve checked in, but I’m still out here lovin’ Forgotten Hits! If anything, FH gets better with time. I know Easter / Good Friday songs aren’t as popular (or numerous) as Christmas tunes, but I’ve just written one called Mystery Man that I wanted to share with you. It features Ron Kaplan, formerly of the Cryan’ Shames on drums, and a string arrangement and mix by Chicago based TV composers Mike Kroell and his wife Swanyce. If it fits into the FH schedule you have planned for the week, would welcome to share it with the Forgotten Hits family. Thanks for all you do at FH and have a great Easter! Marvin Gaye was killed by his father. Sam Cooke was in bed with a woman and got caught & killed by her husband. That's not true. Sam Cooke was killed by a woman, motel manager. I thought overall it was OK ... a couple of great lines ... and, of course, LOTS of great music ... it held my interested for the full 95 minutes. But tell me ... about 30 minutes before it ended ... when Phil's attorney (excellently played by Helen Mirren by the way) did all of her blood splatter tests and analysis ... did you think the for very first time ever that maybe he really DIDN'T do it??? I think she offered a pretty compelling argument (or, at the very least, raised "reasonable doubt"). The case SHE tried was ultimately ruled a mistrial. I cannot help but wonder if, had she stuck with it, she just might have gotten him off! Speaking of great producers, word came this morning that we lost Phil Ramone. I have always been a great admirer of his work, so this was very sad news indeed. Los Angeles (CNN) -- Innovative music producer Phil Ramone, whose work with the major artists of the modern era won him 14 Grammys and prompted the nickname "Pope of Pop," died Saturday morning in a New York hospital, his son, Matt, told CNN. The family did not immediately provide a cause of death. Ramone was 72. Ramone's collaboration credits are a Who's Who of the music industry: Burt Bacharach, Bono, Ray Charles, Bob Dylan, Aretha Franklin, Quincy Jones, Madonna, Paul McCartney, Paul Simon, Frank Sinatra and Stevie Wonder, to name a few. Artists described Ramone with superlatives. "This is so shocking. I just performed for his tribute in December," Franklin said in a statement. "Truly one of the great names in music has gone on, but the melodies will remain." Said Billy Joel: "I always thought of Phil Ramone as the most talented guy in my band. The music world lost a giant today." Ramone was "the star of stars behind the stars," Wonder said. Barbra Streisand recalled working with Ramone in 1967 when she did a free concert in New York's Central Park and noticed "his brilliance at capturing sound," she said. They worked on the film "A Star is Born" and later the soundtrack to "Yentl." "Phil had impeccable musical taste, great ears and the most gentle way of bringing out the best in all the artists he worked with," Streisand said. "The monumental recordings he produced will endure for all time." James Taylor called Ramone "a pioneer" and "a key player in the music of our time." "He lit up any room he entered," Taylor said. Jones said Ramone was a friend and collaborator for more than 50 years. "Whenever I was in the studio recording, if Phil wasn't there by my side it would seem like one ingredient was missing," Jones said. "Today we lost one of the true musicians, innovators and geniuses of the record industry. His immense talents were only surpassed by the gigantic size of his heart." Neil Sedaka said he was 16 years old when Ramone added the rhythm section to his demos, becoming his first two records, "Laura Lee" and "Snowtime." "He knew how to get the most out of the artists he worked with," Sedaka said. "With his passing the record business lost one of the all time greats." Elton John, who also worked with Ramone, called him "a friend, a musical genius and the most lovable person." On Twitter, John Legend þcalled Ramone a "legendary producer." Singer-songwriter Rob Thomas tweeted: "we have lost one of music's greatest producers. a true pioneer and a great man." He worked across all genres of music and served as chair of the board of trustees of The Recording Academy. At the time of his death, he was a board member of the Grammy Museum. Ramone's collaboration with Ray Charles, Billy Joel and Paul Simon won a total of three Album Of The Year awards, and Ramone won Producer Of The Year (non-classical) in 1980, The Recording Academy said. Ramone produced songs and entire soundtracks to several films, including "Flashdance," "Ghostbusters" and "Midnight Cowboy." In television, he produced and supervised music for television specials such as the Oscars, Elton John at Radio City Music Hall, "The Jim Henson Hour" and "The Muppets at Walt Disney World." According to Ramone's website listing technical innovations, he was the first to use a solid-state console for recording and mastering solid state records; to use a digital live recording for Billy Joel's "Songs in the Attic," "paving the way for the widespread use of the compact disc in the pop music world"; and to use the fiber optics system EDNet to record tracks in "real time" from different locations for Sinatra's Duets I and II. Good to see some of Neil Diamond’s early compositions getting a mention. The flipside of Ronnie Dove’s “My Babe” was also a Neil Diamond song, “Put Your Mind At Ease” and Ronnie made it three Diamond tracks with “Back From Baltimore” the following year. The reissue label, Ace, recently compiled a CD of most of the early recordings of Neil Diamond’s songs, entitled “A Solitary Man: The Early Songs Of Neil Diamond”. It’s on sale for around $12 on amazon. One track worthy of immediate attention is “Just Another Guy” from the UK’s Cliff Richard. In 1965 Cliff went to the USA to record with Billy Sherrill and Bob Morgan for Epic. It was released in the UK as the b-side of Cliff’s revival of Sonny James’ “The Minute You’re Gone”, recorded as part of the same session. Notable tracks not on this CD would be Jay & The Americans’ version of “Solitary Man”, possibly their last 45 for UA and Neil Diamond himself with “The Long Way Home”. One of his best Bang recordings, this was a small hit when released as a 45 in 1973. Great Neil stuff today, Kent. FH opens our eyes to stuff we either forgot or never knew. And BTW, the Top Ten the other day was lots of fun too. Enjoyed your six selections today for the FH for Monday. I liked most of Ronnie Dove's recordings with probably his 1966 song HAPPY SUMMER DAYS being my all time favorite. Vic Dana recorded it as well in 1970, not as big a hit as UB40. Journalist DAVE BARRY says that the inspiration to write his "BOOK OF BAD SONGS" came from one newspaper column he had written regarding songs he didn't particularly care for, which generated such an incredible response that he knew he had tapped into a nerve. The catalyst of all of this was none other than NEIL DIAMOND. It would not trouble me if the radio totally ceased playing ballad-style songs by Neil Diamond. I realize that many of you are huge Neil Diamond fans, so let me stress that, in matters of musical taste, everybody is entitled to an opinion, and yours is wrong. Just who the hell do you think you are to blah blah a great artist like Neil blah more than twenty gold records blah blah how many gold records do YOU have, you scum-sucking wad of blah. I personally attended 1,794 of Neil's concerts blah blah What about 'Love On The Rocks,' huh? What about 'Cracklin' Rosie'? blah blah. If you had ONE TENTH of Neil's talent blah blah. So I listened to 'Heartlight' forty times in a row and the next day the cyst was GONE and the doctor said he had never seen such a rapid blah blah. What about 'Play Me'? What about 'Song Sung Blah'? Cancel my subscription if I have one. Please stop writing! You have convinced me! Neil is a music god! I worship Neil on a daily basis at a tasteful shrine to him erected in my living room! I love ALL the songs Neil sang to us! Not to mention all the songs he brang to us! I FINALLY SAW THE NEW COWSILLS DOCUMENTARY, AND THE PUNDITS WERE RIGHT ... IT'S A VERY SAD STORY INDEED! AND KENT, I DO HAVE THE FULL LENGTH VIDEOS YOU SEE IN THE DOCUMENTARY THAT I RECEIVED FROM THE BAND SOME YEARS AGO. EVEN THOUGH I'M GOOD FRIENDS WITH THE BAND AND I'VE HEARD MOST OF THE STORIES, IT WAS STILL ENJOYABLE ENOUGH AND YOU HAVE TO ADMIT THEIR HARMONY WAS RIGHT UP THERE WITH THE BEACH BOYS AND THE HOLLIES (WHO, IN MY OPINION, WERE THE TWO PREMIER HARMONY GROUPS OF THE EARLY 60'S). I STILL RECALL SEVERAL YEARS AGO IN TENNESSEE AFTER A SHOW (WHERE WE HAD A BIRTHDAY PARTY FOR SUSAN IN MY ROOM), WHEN SUSAN DROPPED THE "DAD 'TOUCHED' ME" BOMB AND I WAS LIKE ... "DID SHE JUST SAY WHAT I THOUGHT SHE SAID?" I NEVER REPEATED THAT UNTIL NOW, SINCE IT'S ALL OUT IN THE DOCUMENTARY. BUD WAS A TRIP AND A HALF, AND THEN SOME. MY ONLY DISAPPOINTMENT WAS THAT THERE WAS NO MENTION OF THE FINAL YEARS OF BARBARA, EVEN THOUGH I KNOW IT'S STILL A SORE SPOT WITH THE FAMILY ... VERY SAD, INDEED, BUT LET'S RAISE A TOAST TO THE AWESOME MUSIC THESE KIDS PUT OUT IN THEIR TOO SHORT CAREER. P.S. YOU CAN DOWNLOAD THE LAST COWSILLS ALBUM FEATURING "SOME GOOD YEARS" FROM THEIR WEBSITE, AND WHEN YOU DO, I BELIEVE YOU GET A BONUS XMAS TRACK FROM SUSAN WHICH IS BEAUTIFUL, AND NOT ON THE ORIGINAL ALBUM. It was exactly 50 years ago that The Beach Boys released the Surfin’ USA album on March 25, 1963. While most of the album reflects a very young and developing Brian Wilson, it also represents a gritty garage band sound. Mike Love and David Marks were there. The two founding members took the time to answer a quick q&a about this memorable album and single. With the benefit of 50 years hindsight, I think George Martin played it pretty safe when recording that first album ... The Fab Four covered Arthur Alexander's "Anna", "Chains" by The Cookies, "Boys" (a great Ringo vocal, by the way) and "Baby It's You" by The Shirelles, a show-tune ("A Taste Of Honey", one of Paul's first show-off ballads) and a rockin' version of The Isley Brothers' hit "Twist And Shout." These were all songs the boys had been performing on stage for years ... and they wrapped up their entire LP in one very long 13 hour day. But tracks like "I Saw Her Standing There", "Please Please Me", "Love Me Do", "P.S. I Love You", "Do You Want To Know A Secret" and their versions of "Boys" and "Twist And Shout" have stood the test of time. Even fifty years later it's not at all uncommon to hear these tracks played on the radio on a semi-regular basis. On the other hand, "Surfin' USA" (not The Beach Boys' first album ... "Surfin' Safari" had come out the year before) hasn't held up quite as well. Yes, the title track is still strong ... but short of an occasional spin of "Shut Down", what else from this LP do we still hear? "Lonely Sea" is a song that deserved a better fate ... but that's about it. As for interviewing Lujack for Landecker's book, that's just NOT a good idea. Lujack would build himself up at anyone's expense. However, he has a right to. Landecker was great, but Lujack was revolutionary. That IS Lujack's schtick and claim to fame. He was an aquired taste, but many more know this legend than John Records. As you say, he was kind of the Howard Stern of the 60's. I would say guys like Bob Crane before Lujack had their Howard Stern days as well, so it was not new to break barriers, but Lujack was MY era and he lasted a long time in the spotlight. John Records should have expected this and told them NOT to get Larry on the air with him. I think the thing I love most about Forgotten Hits is that you always take us along for the ride. You are in the enviable position of being able to talk to so many of these artists and nail down the answer to a question ... and even when something doesn't go exactly according to plan (like your recent trivia contest with Joel Whitburn ... where it turned out that the right answer was actually the WRONG answer! ), you choose to not only share it with us ... but include us in on the whole process of sorting it out. I think most publications wouldn't have ever even shared that information with their readers ... they simply would have buried it to cover up what might otherwise be perceived as a failing on their part of some sort. But instead you not only discussed it, but you brought it to the forefront and presented it in the most entertaining way. I'd venture to say that most of us never would have even known (or cared) about this Mae West album ... or the group Somebody's Chyldren ... or the fact that Joel's book said it was Gary Lewis and the Playboys pictured on the cover. But you took ALL of that and turned it into a very interesting and entertaining feature. And THAT is what sets Forgotten Hits apart from any other music publication. You may be the one driving the bus, but you're enjoying the ride right there along with us. Thank you so much for taking us along on this always enlightening adventure. You hit a grand slam with today's post -- excellent on multiple fronts (entertaining, informative, the reader responses -- [Whitburn and his winner], the coherence in your writing and the tightness of your content. Possibly the best daily post I've read in FH (except maybe for the day your review of Ranking The 60s came out!). The Somebody's Chyldren track brought me to Twas Brillig's wonderful Dirty Old Man. That little acid-rocker from Minnesota on the Date label REALLY blew my mind. Whoever the keyboardist was -- WOW!!!!! Arthur Lee-like vocals mixed with a "Leo and the Prophets / Blues Magoos / Castaways" electric sound. Dig it, folks! Mike Dugo of 60sGarageBands.com told me that he interviewed Somebody's Chyldren leader David Clark Allen for his publication a few years back. I would love to talk to him now, too ... if only to find out what it was like working with Mae West ... and how they got the gig. 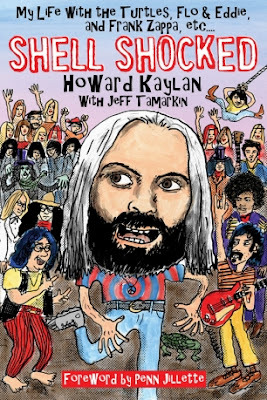 Forgotten Hits Reader Tom Cuddy just sent us this official press release for Howard Kaylan's new book, 'Shell Shocked" ... but that was already old new for FH Readers ... we got the official word a couple of weeks ago from Howard himself! (In fact, I'm hoping Howard will autograph a copy to be given away to a lucky Forgotten Hits Reader!) So Stay Tuned! Meanwhile, this book looks like a WHOLE lotta fun ... so be sure to pick up YOUR copy today!!! If Howard Kaylan had sung only one song, the Turtles’ 1967 #1 smash hit “Happy Together,” his place in rock and roll history would still be secure. But that recording, named in 1999 by BMI as one of the top 50 songs of the 20th century, with over 5 million radio plays, is only the tip of a rather immense iceberg. For five decades, Howard Kaylan has been a key player at the heart of the rock and roll revolution. In addition to his years with the Turtles — whose other best-selling hits include “She’d Rather Be With Me,” “You Baby,” “It Ain’t Me Babe,” “She’s My Girl,” “Elenore” and “You Showed Me” — Kaylan was a core member of Frank Zappa’s Mothers of Invention and half of the much loved duo Flo & Eddie. Howard’s voice has also appeared on recordings by a vast array of artists including Bruce Springsteen, T. Rex and Alice Cooper. Kaylan’s years with the Turtles are the stuff of legend: the first rock group to perform at the White House, wild encounters with the Beatles and Jimi Hendrix (on the same night! ), countless TV and concert appearances, and a string of hit records that have never lost their popularity. But while most artists would have been happy for the five-year success that the Turtles enjoyed, for Howard Kaylan that run at the top of the charts was only the beginning. His two years with the renowned Zappa were an education and a complete artistic upheaval, marked by highs such as sharing the stage with John Lennon and Yoko Ono and lows like watching the band’s equipment burn to a crisp at the notorious Montreux fire that later became the subject of the Deep Purple classic “Smoke On the Water.” Kaylan appeared on four Mothers of Invention albums and in Zappa’s theatrical feature film 200 Motels. Following their stint with Zappa, Kaylan and fellow Turtles/Mothers vocalist Mark Volman went off on their own, calling themselves at first The Phlorescent Leech and Eddie, and then just Flo and Eddie, until reclaiming the Turtles name. This year marks the 50th anniversary of Howard Kaylan’s entry into professional music and he’s still out on the road with Mark singing the hits! Shell Shocked: My Life with the Turtles, Flo and Eddie, and Frank Zappa, etc. (Backbeat Books, April 16, 2013) is Howard Kaylan’s incredible story, a timeless rock and roll tale— intensely colorful, brutally honest, and a whole lot of fun! And while we're on the subject, check this out! Howard Kaylan's brand new book just came in at #1 on Amazon's Best Sellers List for music-related books! #1 in two categories and into the top 1000 overall. Order the champagne and coke. Not bad for day one. Tuesday, April 2, 2013; 8:00 p.m. If Howard Kaylan had sung only one song, the Turtles’ 1967 number-one smash hit “Happy Together,” his place in rock-and-roll history would still be secure. But that recording, named by BMI as one of the top 50 songs of the 20th century, with more than 5 million radio plays, is only the tip of a most remarkable iceberg. Most artists would have been happy for the five-year success that the Turtles enjoyed, but for Kaylan, that run at the top of the charts was only the beginning. After Turtles broke up in 1970 Kaylan, along with career-long partner Mark Volman, surprised the rock world by joining Frank Zappa’s group the Mothers of Invention. Overnight, Howard’s squeaky-clean image as an AM radio hitmaker was turned inside out. Hosted by GRAMMY Museum Executive Director Bob Santelli, hear Kaylan talk about his place at the vortex of rock culture since the heady 1960s, how he remains immersed in that culture today and his memoir, Shell Shocked: My Life with the Turtles, Flo and Eddie, and Frank Zappa, etc. Written with music journalist Jeff Tamarkin, Shell Shockedwill stand alone as not only one of the best-told music-biz memoirs, but as a candid and unmatchable story of rock-and-roll insanity and success from a man who glories in it all. After the discussion, Kaylan with take audience questions and perform a stripped down set. Hot on the heels of their recent Showtime documentary "The History Of The Eagles" (available on BluRay and DVD at the end of April), The Eagles have announced that they'll be touring again. More dates are expected to be added. Also hitting the road (and it'll be a WORLD Tour this time around) is Sir Paul McCartney. Johnny Farina of “Santo & Johnny” has been touring Europe and America for the past Fifty years, regularly performing at Concerts and Festivals and has also been well received in Mexico and Australia, too. “Santo & Johnny” collected a Gold Record in 1959 for their prolific original instrumental tune – “Sleep Walk” – which they wrote and released that year. This song has been covered by more than Two Hundred different artists in its long history and has been heard in over Twenty Movies, TV Programs and Series and TV commercials as well, from 1959 to 2013. Even more remarkable is the fact that this composition has recently been credited with over Four Million Certified Airplays since its release in 1959! “Santo & Johnny” had a TV Show in Italy and were also inducted into the Hall of Fame there for the success of their instrumental version of “The Godfather Theme” –which remained in the Number One position on the charts in Italy for Twenty Six weeks in 1973, and for which they also earned a Gold Record. And Robbie Woliver of “The Long Island Voice” commented in 1998 that “Sleep Walk” is “….part of our collective being, it’s in our DNA. You know it, even if you never heard it.” In the same year, Johnny was also awarded the Long Island Music Awards “Hall of Fame Award” for “Sleep Walk” at their annual Awards Ceremony. Capping this Award, “Sleep Walk” was recognized again in 1999 with a Grammy Award for the Best Pop Instrumental Performance, as recorded the year before by “The Brian Setzer Orchestra” (Former Front Man and Guitarist of ”The Stray Cats”). In 2002, “Santo & Johnny” were inducted into the “Steel Guitar Hall of Fame” in St. Louis, in acknowledgement of their outstanding work on this unique instrument over the years. Following that, Johnny was recently awarded the “Lifetime Achievement Award” in 2011 for “Sleep Walk” in recognition of its repeated use in full length feature films at the “Long Island Film Festival”. I'll be doing a one hour show on Saturday, June 8th. Like to see you there. The recent Tommy Roe “controversy” brought to mind a fond memory of seeing Tommy perform at the Wisconsin State Fair. Tommy was performing at a no-charge, garden-type stage and kicked off his set with the crowd favorite Sheila. Later in the show a man came in with his family and shouted out, “let’s hear Sheila”. Tommy replied, “We already did that one but, what the heck, we’ll do it again!” The crowd loved it. I found Tommy to be one of the most enthusiastic and crowd-pleasing performers I have ever seen in concert. His music is upbeat, fun and family friendly. I hope Tommy gets up this way so I can see him again. Congrats to Ron Onesti. His double main event - War and Tower of Power - at the Arcada last Saturday night was off-the-charts tremendous. You can talk about Chicago 24 hours day, but nobody matches Tower's horn section. It was especially cool to see Stephen "Doc" Kupka, the "Funky Doctor", knock the ball outta the park with his baritone sax. Backstage, before Tower roared its way through 90 solid minutes, Doc's sax and his trademark fedora were at rest on an amp with a small sign that simply read, "Don’t even think about it." I had really wanted to see this show as I figured it'd be killer. Glad to hear they didn't disappoint. The Arcada Theatre has lots of other great shows coming up ... with new artists being added to the line-up all the time. And it's a GREAT place to see a concert. Now there WAS a time when April Fool's Day provided an excuse to dig all of the old novelty records out of mothballs and play them on the air again ... featuring one or two per hour throughout the day. But for the last several years we have worked in conjunction with Scott Shannon and The True Oldies Channel to feature "Fool" Songs on the radio ... and tomorrow will be no exception. But this year ... as an extra added bonus ... we're ALSO going to be featuring Fool Songs throughout the day on the website ... and we'll dig a little bit deeper than he is able to within the context of his show. April Fool's Day is NO Joke here in Forgotten Hits ... GREAT "foolish" music throughout the day.